Cori was born to the Yahgu’laanaas Raven clan on Haida Gwaii. Her family moved to Ottawa within a few years of her birth, but her connection to her Haida roots was maintained by weekly visits to the permanent collection of Haida works on display at the Canadian Museum of Civilizations in Gatineau, QC. Cori returned to Haida Gwaii in 2002, and quickly immersed herself in the art of her ancestors. Exploring 2 dimensional design, cedar weaving, painting and taking part in multiple design workshops taught by Robert Davidson in Old Massett and Skidegate. 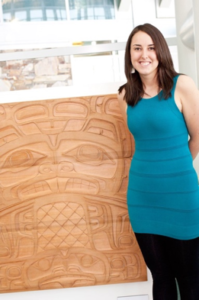 Cori is a former recipient of the YVR youth scholarship award as well as the YVR Frank O'Neill visionary award. These awards enabled her to begin and maintain a formal apprenticeship working with renowned Haida artist Reg Davidson in Old Masset. Over the course of 8 years, Cori learned carving techniques applicable to masks, sculptures and monumental works, taking part in multiple totem pole projects. Cori now lives and works from her home studio in Skidegate, Haida Gwaii and maintains a working relationship with her mentor Reg. She also spends time learning from and working with Ben Davidson, expanding her knowledge and skills in painting and carving in his studio and gallery in Skidegate.